If newly leaked images are to be believed, Microsoft’s upcoming device, rumored to be a potential competitor of Apple’s iPhone 6 are now online. Codenamed McLaren, the device’s images were published on China based website Baidu. The images showed the possible flagship Windows Phone smartphone, lying next to an iPhone 6. 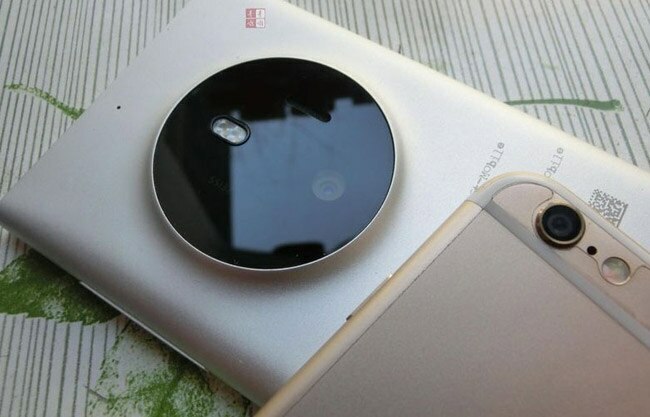 Judging from the images, it can be seen that the device has a massive camera on the rear end as well as a 5 inch screen. It is also larger, taller and thicker than the iPhone. Microsoft has been secretive about any moves on a flagship device. It is notable that Microsoft has removed Nokia’s brand name from Lumia phones after it acquired Nokia. It will now sport only Microsoft logos. Rumor has it that Microsoft is working hard to create a flagship phone that will compete with the likes of the iPhone 6, as well as those from HTC, Samsung etc. Only time will tell if Microsoft can succeed in that.